I updated my etsy shop — and have new pieces to share! A variety of corpse paint dolls and some with a tribal aesthetic. All are heavy on stitchery and of course, lots of black. Check it out now! 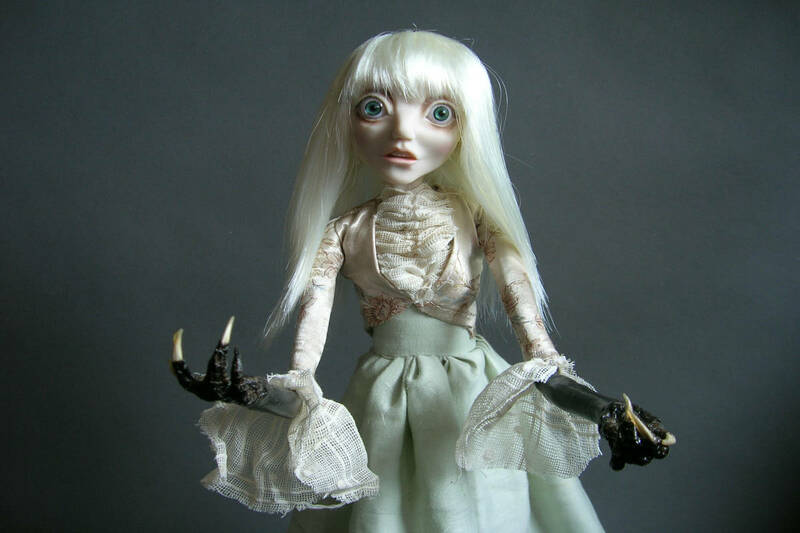 New doll offerings! Click on the thumbnail to see the full image and to order online. 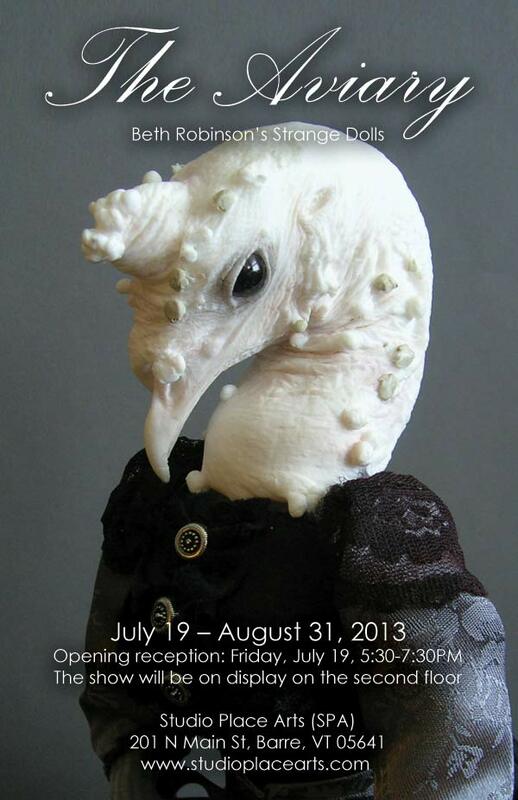 My solo show “The Aviary” opens July 19! An Aviary is a large enclosure for confining birds. In the Strange Dolls’ Aviary you will find birds that have become so comfortable living outside of their natural habitat, that they have started to adopt certain humanoid traits. Enjoy anthropomorphic sculptures and prints of these dandies and ladies on the 2nd floor of Studio Place Arts in Barre from July 19 through August 13. 2013. I just got back from a whirlwind trip to NYC to catch the Brothers Quay exhibit before it disappeared. We saw it on the 5th. It came down on the 7th. The Brothers Quay were a huge inspiration to me when I first started making dolls. 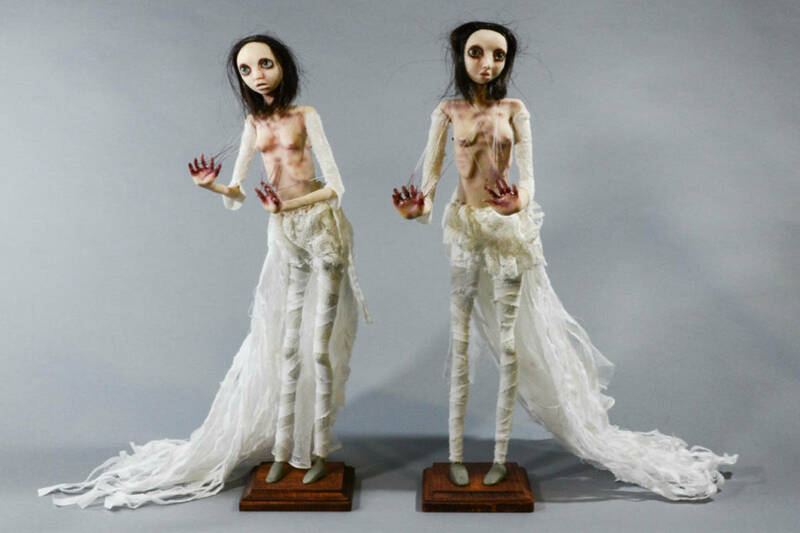 When asked, I often say that Japanese doll artists were my inspiration, but the Brothers Quay and Jan Švankmajer fall in line quickly as a second and are probably a more important influence because of the context of their work. Being a fan of their puppets and stop motion, seeing their exhibit at the MOMA was profound. I walked away with a greater understanding of the Quays as, not only stop motion animators, but as extremely versatile artists. The color of the walls and lighting. I know it seems silly but I recently had a conversation with a painter about the white wall trend in museums and galleries, his opinion was that white walls don’t flatter most work. I have to be honest, the color of gallery walls never occurred to me, but it was fresh on my mind when I walked into the Quay exhibit. The walls were painted dark grey and there was no strong overhead light, everything was spot lit. It was so atmospheric and fitting for the style of the Quays but really – hats off to the curators who had to find a way to incorporate films – which need darkness to enjoy them – and light – to enjoy the exhibit. It was easy to move between the films and the artwork. I adored the sentimental touches. They made a display of the more personal objects in their studio: the Polish posters that they wallpapered their first studio with and would strongly influence their style. A new understanding and appreciation for their stop motion film “In Absentia“. “A seated woman, alone… in a room on one of the top floors of an asylum, repeatedly writes on a piece of paper and sharpens pencils. The pencil point often breaks under her fingers’ force. She places the broken points outside the window on the sill. 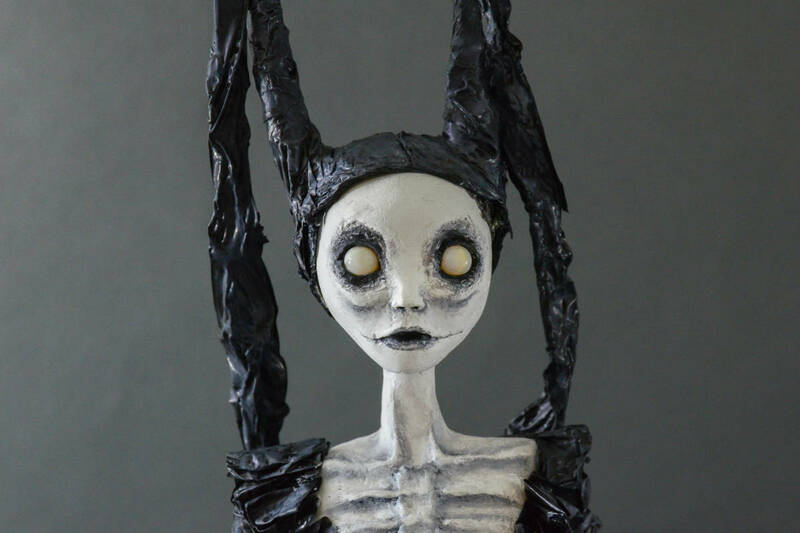 A satanic figure is somewhere nearby, animated and made of straw or clay, not flesh… She finishes her writing, tears the paper from the pad, folds it, places it in an envelope, and slips it through a slot that contains many more letters.” (wiki). The letters simply contain the words “Sweetheart Come” written over and over itself until it is almost illegible. The woman was Emma Hauck, a real woman diagnosed with dementia praecox in the late 1800’s. In the exhibit was the actual letter (which really did look like neat but demented scribbling) and photographs of the woman and the husband that the letters were addressed to. The bunny and doll from the His Name is Alive music video “Are We Still Married” that the brothers directed. We got to the MOMA on Friday evening and didn’t realize that between 4 and 8pm on Friday nights admission is free (sponsored by Target). Getting in free is AWESOME but our time frame to see the exhibit was short and the line to get in wrapped entirely around the building. So we stood in line for a half hour or more when we would have just as happily paid to get in. Closing time at the MOMA was like rats trying to scurry from a burning building. It was kind of crazy (shown above are the escalators filled with people trying to simply leave). Good way to start 2013!